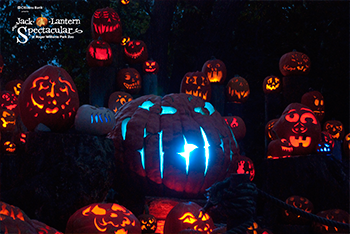 Each fall, families flock to the Roger Williams Park Zoo in Providence, RI for their annual evening tradition, The Jack-O-Lantern Spectacular, from October 3 - November 1, 2015. This mesmerizing month-long experience features more than 5,000 illuminated jack-o-lanterns along the Zoo&apos;s quarter-mile-long Wetlands Trail. More than 125 of the gourds are carved works of art that highlight the annual theme. This year&apos;s theme, titled "The People&apos;s Choice," will feature subjects the public especially loved throughout the past 27 years of shows. Scenes filled with intricate pumpkin art will recall the "Phantom of the Opera," the Golden Age of Hollywood, and other cultural and historic highlights. Charles Darwin&apos;s trip to the Galapagos Islands will be represented, complete with "active" volcanoes, and the 50th anniversary of "The Sound of Music" will be celebrated. There will also be the addition of light and image projections to enhance the scenery along the trail. Everyone&apos;s childhood favorites and Halloween scenes will return, as well as the show&apos;s dazzling grand finale, the Laughing Tree. There, hundreds of glowing jack-o-lanterns on the ground and high up in the trees surround carved giants (well over 1,000 pounds) arrayed in the forefront, with spooky fog and the now iconic musical theme punctuated by a catchy beat and laughter. 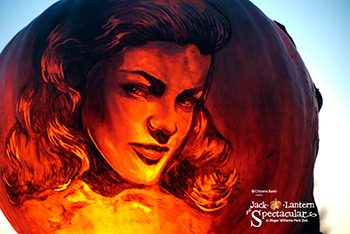 New this year, people can purchase tickets to the Jack-O-Lantern Spectacular online. Those interested in attending can buy their tickets now to use any night of this year&apos;s show. Alex Weston is the communications representative for Roger Williams Park Zoo. Along with writing and maintaining the Zoo's website, she also represents RWP Zoo as a media liaison. When she isn't doing that, she enjoys spending time with family, friends and her two cats. In her spare time, Alex loves to sketch, rock climb, swim and read.